Catherine Moody Runciman is almost certainly named for the wife of Cosmas Henry Stewart. 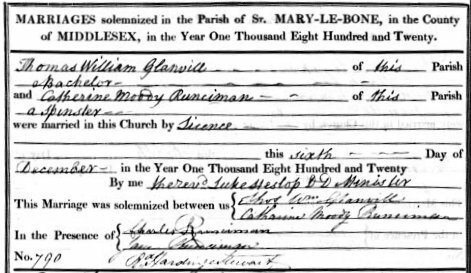 The record of the marriage between Cathe Moody Runciman and Thomas William Glanvill at Marylebone in 1820. Josephine Glanvill born 13 Aug 1834; Baptised 27 Nov. 1834 at St Mary Paddington. Reginald Glanvill, born 6 April 1837; Baptised 24 Nov. 1837 at St John's Paddington.